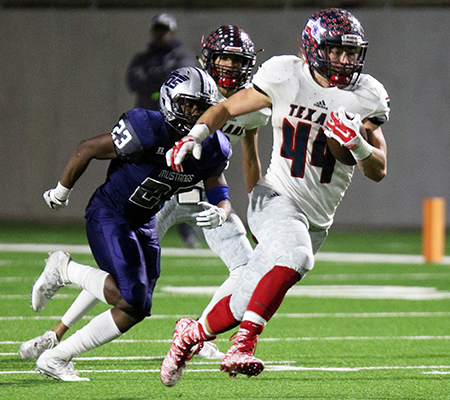 KATY – Not even a high-powered pass attack could help the Wimberley Texans from becoming the West Orange-Stark Mustangs’ 40th victim in a row. Smothering defense, along with a handful of explosive plays on offense, allowed WO-S to gallop away with a 30-21 state semifinal win Dec. 14 at Legacy Stadium. 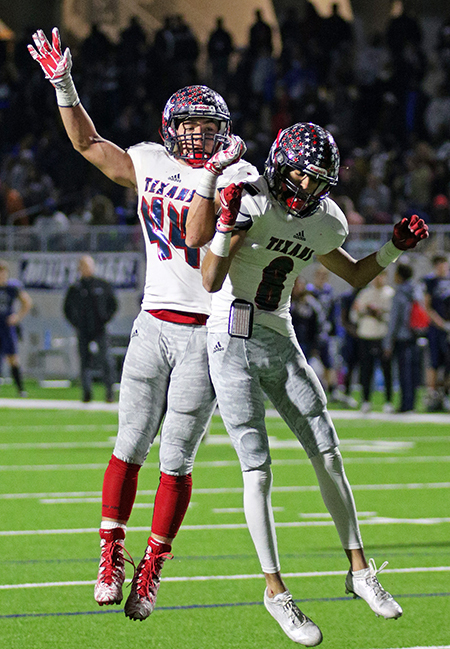 But amid the sadness of a season ending one step short of state, Texan head coach Doug Warren celebrated his program’s achievement in reaching the 5th round of the playoffs for the first time under his guidance. Wimberley (13-2) was unable to corral WO-S quarterback Chaka Watson, who finished with a game-high 241 rushing yards and two highlight reel touchdowns in the contest. Watson’s game-breaking moment came in the second quarter when he rattled off a critical 99-yard touchdown run that gave WO-S a 20-14 advantage. Warren said WO-S had a “good athlete” in the backfield, but knew the Texans had to limit his explosive plays. While the Texans did that for the most part, Watson made the plays in critical moments. WO-S took control of the game several minutes later when Jarron Morris ran back a 77-yard punt return to give WO-S a 27-14 lead late in the second quarter. Wimberley, however, fought to stay in the game as much as possible. They countered with a 39-yard touchdown pass from quarterback JoJo Weeks to wide receiver Gavin Martinez, which cut the WO-S lead to 27-21 at intermission. Wimberley was held scoreless over the final two quarters of the ball game. 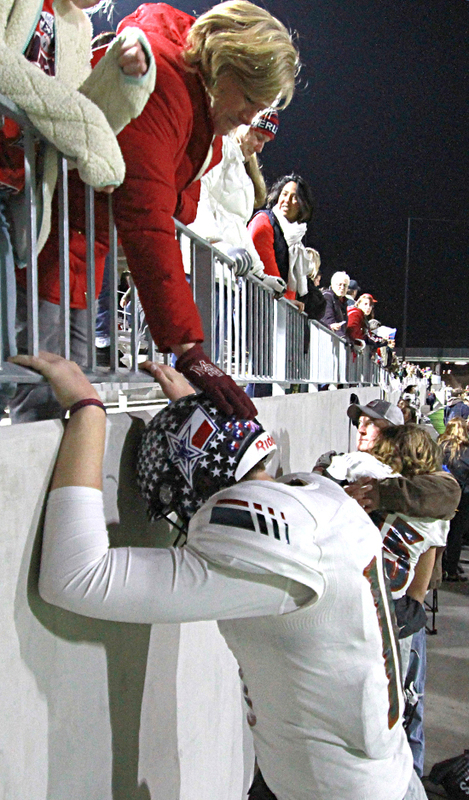 It was one of the few times Wimberley was not able to score in a quarter this season. “We had to make plays. We did that a few times, but we didn’t do that enough,” Weeks said. Warren said the Texans understood the Mustangs were focused on stopping the run, which he said they were going to hang their hats on. Wimberley was held to 87 rushing yards in the game. Senior running back Thomas Carruthers was limited to 56 yards in the game. But for Weeks, the ability to take the Texans the furthest its ever gone since the program claimed the 2011 state title was a thrill.